Let’s take a short break from mourning for the shattered dream of a Romney presidency and remember another casualty of Super Tuesday: the Alcatraz proposal on the San Francisco ballot. Proposition C would have changed city policy towards the island, hoping to turn the former prison into a more uplifting kind of monument, but it failed to pass. I voted for this proposal. I have long thought it is a shame that, while New York City has the Statue of Liberty on its harbor island, San Francisco, of all places, has a prison. Yes, it’s historical, but why is that a piece of history we want to remember? Sure, it’s a tourist attraction, but if you enjoy vacation trips that involve cramped boat rides and being locked in a cell, Carnival Cruise Lines has a better buffet. So I say, blow up the prison and build something there we can be proud of. And there’s the problem — getting San Franciscans to agree on what we would be proud of. Proposition C, unfortunately, was sponsored by the "Global Peace Foundation," which wants to turn Alcatraz into — not surprisingly — a Global Peace Center. Exactly what this means was not entirely clear, and I’m not sure it was all that clear to the GPF. While the plan did involve removing the main prison block, which I’m all for, it then involved replacing it with a "Harmonium," which I’m less sure about. The Foundation’s website (which may now be down) described the Harmonium as "an aesthetically beautiful multi-faceted geodesic dome" that would "employ advanced three dimensional holographic sound technologies and other special effect technologies which will which will [sic] promote and elicit a deep meditative, transpersonal and transcendental experience! An Ascension Experience!!" The sun would shine on it all the time. 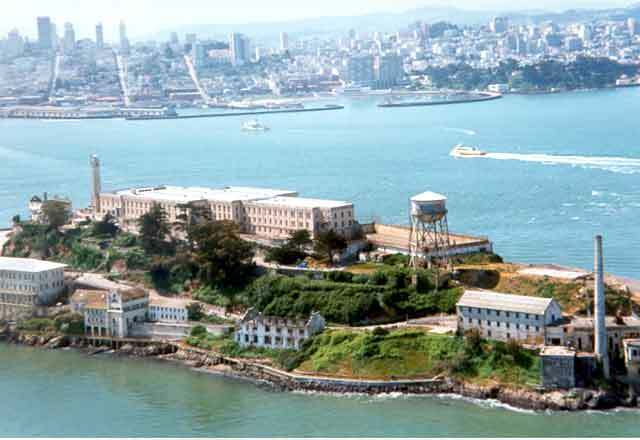 There would also be a statue of St. Francis and as a nod to those who love prisons, an Alcatraz Museum. The "jagged cliffs" of the Rock would be smoothed and "redesigned with graceful curves," and a "permanent MEDICINE WHEEL and LABYRINTH" would provide "sacred sanctuary and ceremonial spaces." The GPF’s director says that this vision came to him in "a flash, and I wasn’t on any drugs, either." The director, who goes by the name "DaVid" (or "Da Vid" — reports vary) told the SF Chronicle the island is a "major power point" for planetary energy. Apparently it can also generate money, because when asked who would pay the estimated $1 billion cost of the project, he said that "money will come." He suggested the Bechtel Corporation could "create some good karma" by doing it for free. I voted for this despite the freaky details because I like the basic idea and didn’t expect it to win anyway. Apparently, about 58,000 people felt the same way. Proposition C failed, but got 58,750 votes (151,555 voted no), meaning that 27.94% of San Francisco voters supported this fairly loony proposition. 1.13% of them supported Mitt Romney.